Today has been a day of cooking in unknown territory. From my home country Sweden to Szechuan in south-west China. First herring ice cream, a dish the idea of which is so revolting I thought it had to be a joke (no joke, photos so far on Flickr, blog post following tomorrow after eating it). 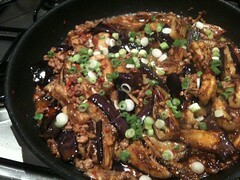 Then, inspired by Lizzie (@hollowlegs) with her blog Hollow Legs the dish pictured above, "Fish-fragrant Aubergines". Confusingly there is no fish in this dish. Apparently it is so named since the combination of garlic, ginger, chilli and spring onions is the hallmark of traditional Szechuan fish cookery (see another variation on the recipe by Fuschia Dunlop). While I love Szechuan (or Sichuan, no clue if one or the other is more "correct") food I rarely ever try cooking it at home. I get as far as the ingredient list in the recipe and as I realise just why the dishes become so tasty and fragrant my eyes glaze over thinking about getting and preparing all the items in the list. Thankfully the recipe for Fish-fragrant Aubergines is on the shorter side, and it also seemed quite simple to put together. Quick frying and vigorous stirring, I can do that. With my mind set on spicy Chinese for dinner I picked up beautiful aubergines, spring onions and pork at Borough Market (where the people in the stall next to Ginger Pig kindly minced the meat right there and then). On my way home to Peckham I stopped by Man Gee, a great little well stocked Chinese grocery store on Old Kent Road to get the black rice vinegar, Chinese cooking wine, chilli bean paste and some other bits and pieces. As it turned out cooking this dish was really quick and simple. And as tasty as it was quick. Amazing return on time investment! See the photoset on Flickr for more photos. Rather than me waxing lyrical about how the silkiness of the aubergine works so well with the chilli heat, check out Londonist who were treated to dinner at Lizzie's place. Well captured, with lots of nice photos. Since we don't eat rice we upped the amount of pork instead and used 300 grams of the porky goodness rather than just 100. When served without rice, perhaps with some steamed cabbage or tender stem broccoli instead, this is a nice treat when on a low carb diet. There is some sugar in the recipe and sauces, and some corn flour for thickening but it is all in tiny amounts. Will definitely be cooking this again, and next time follow Lizzie's example and play around with the ingredients. I have a feeling tofu or mushrooms with the aubergine will taste amazing in this. Get the recipe from Lizzie's blog: Hollow Legs does Fish-fragrant Aubergines.